One of America’s top psychiatrists claims that there’s a growing epidemic of demonic possession in the world today, and is often mistaken for mental illness. Dr. Richard Gallagher claims that, despite conflicting opinions within mainstream medical science, demonic possession is both real and spreading unchecked. Naturalnews.com reports: With 25 years of experience under his belt as a private psychiatrist that compliments his two teaching positions at both New York Medical College and Columbia University, Dr. Gallagher believes he holds a unique vantage point in discerning between human and non-human, or satanic, behavior. He’s also a highly sought-after professional of such things in cases where a determination is being made about the possible need for an exorcism. Having evaluated hundreds of cases of possible demonic possession towards this end, Dr. Gallagher is certain that the phenomenon is legitimate and pressing. He insinuated to The Telegraph (United Kingdom) during a recent interview that demons know full well how to trick human beings because they possess far more advanced cognitive faculties. They routinely use these mental “smarts” to control the humans they possess, causing many of them to commit atrocities and other evils against other people and lifeforms. 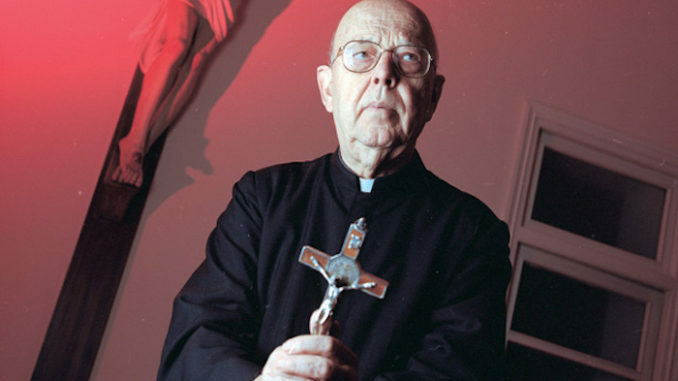 Dr. Gallagher’s sentiments align with other recent reports about rising demand for exorcisms in the Roman Catholic Church. The Vatican actually held a training course earlier this year to teach exorcist priests how to handle this influx of demon-possessed humans. According to data from the United States, the number of priests trained in performing exorcisms has increased from a mere 12 about a decade ago to 50 – a more than 300 percent increase. This dramatic jump shouldn’t be ignored, says Dr. Gallagher, who while he’s not alone in his opinions is among a small few who are willing to talk about it professionally. At the same time, Dr. Gallagher warns that it’s important to determine without any doubt that a person actually has a real demon before recommending that he or she visit an exorcist.